Working under the supervision of a physical therapist, most physical therapist assistants (PTAs) can find employment opportunities in nursing homes, hospitals, fitness centers, and clinics. Physical therapist assistants work directly with patients to help improve movement and heal injuries that can potentially result in a lack of mobility. With many career opportunities opening up in this industry, physical therapy assistants can find work throughout the United States, working in nursing home facilities, hospitals, and other medical facilities. 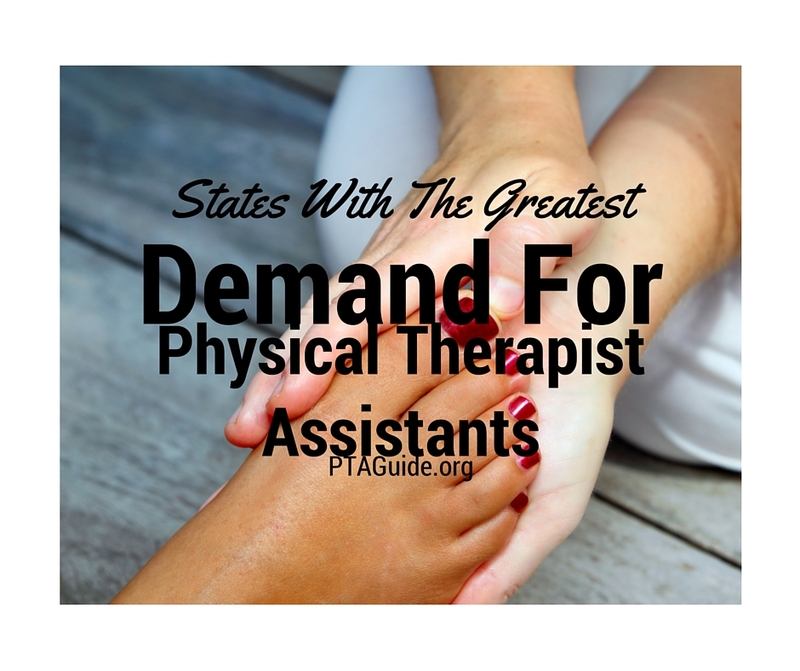 Depending on the current population and demand for physical therapist assistants, some states hold more employment opportunities for PTAs. Below are the top five states in the nation that have the most physical therapist assistants on payroll. Companies throughout Ohio currently employ 5,090 physical therapist assistants, providing them with an average wage of $55,110 annually. The employment ratio for physical therapist assistants in Ohio is currently 1.01 out of every thousand jobs, making this state a top contender for those seeking a position at an upstanding company. As of May 2012, approximately 5,040 physical therapist assistants have found employment positions at companies in Texas. The physical therapist assistants’ employment ratio per thousand jobs is considerably lower than Ohio at 0.48, but the average wage is higher at $65,620 a year. Florida comes in third for employing PTAs, with the total number of assistants reaching 4,630 statewide. The average salary for a PTA is $57,340 annually, and the physical therapist assistants’ employment ratio per thousand jobs is higher than Texas at 0.64. California ties with Florida for third in career opportunities, with companies employing 4,630 physical therapist assistants who earn an annual mean wage of $59,570. At only 0.32, the employment ratio per thousand jobs for PTAs is one of the lowest for all 50 states. Companies throughout Pennsylvania currently employ 4,170 physical therapist assistants statewide. The average salary is considerably lower in Pennsylvania, with PTAs making $43,630 a year, and the physical therapist assistants’ employment ratio per thousand jobs is 0.75. Most individuals may expect that large states, such as Texas and California, employ the highest number of physical therapist assistants. In order to get an accurate picture of a state’s demand for physical therapist assistants, the job concentration, or physical therapist assistant employment ratio per thousand jobs, must be considered. Below are the five states that have the highest concentration of physical therapist assistant per thousand jobs. West Virginia has the highest physical therapist assistant employment ratio per thousand jobs, being 1.05 in all 50 states. Due to its smaller size, West Virginia only employs 740 physical therapist assistants who earn an average wage of $43,630 annually statewide. Ohio ranks towards the top of this list as well, with a PTA employment ratio per thousand of 1.01. Companies employ 5,090 physical therapist assistants who earn an average salary of $26.50 an hour, or $55,110 a year. Alabama ranks third on this list, with a PTA employment ratio per thousand jobs of 1.00. Employers throughout Alabama currently employ 1,830 physical therapist assistants who earn an average annual wage of $50,850. Tennessee comes in at a distant fourth, with 0.83 being the physical therapist assistant employment ratio per thousand jobs. Physical therapist assistants currently earn $51,100 a year on average, and companies employ approximately 2,200 physical therapist assistants statewide. Missouri is a close fifth on this list, with a PTA employment ratio per thousand jobs of 0.81. Companies in Missouri have 2,110 physical therapist assistants on staff, earning an annual mean wage of $48,950. Depending on the local geographic market, the annual salaries of physical therapist assistants can fluctuate as much as $20,000. Below are the five states that pay physical therapist assistants the highest salaries. Texas makes the top of this list, with physical therapist assistants making an average salary of $65,620 a year. Collectively, the 5,040 physical therapist assistants who work in this state make an hourly mean wage of $31.55. Although Nevada currently employs only 380 physical therapist assistants statewide, the mean annual wage is $61,180. PTAs who work hourly instead of salary make a mean wage of $29.41 per hour. New Jersey ranks third on this list, with the average PTA making $59,630 annually. The mean hourly wage of the 1,060 physical therapist assistants who work in New Jersey is $28.67, coming in just ahead of what their counterparts in California make. Employers in California pay their 4,630 physical therapist assistants an average salary of $59,570 a year. When broken out, physical therapist assistants in California make $28.64 an hour. Connecticut comes in fifth out of the 50 states, with the average PTA making $57,620 a year. Although businesses employ only 480 physical therapist assistants throughout Connecticut, the average hourly wage comes in at a respectable $27.70. According to recent research conducted by the U.S. Bureau of Labor Statistics (BLS), companies throughout the United States currently employ 69,810 physical therapist assistants who earn an average annual salary of $52,320. One promising aspect of this sector of the economy is its growth rate, with an employment increase of 41 percent over the next ten years. This faster-than-average growth will result in 49,400 new employment opportunities for today’s physical therapist assistants. Physical therapist assistants make a difference in every life they touch, helping sick and injured patients regain movement and manage pain. Those who wish to make a noticeable difference in peoples’ lives will enjoy the direct contact PTAs have with their patients. Individuals seeking a career with job stability and a higher salary should seriously consider earning their physical therapist assistant degree.